Hence, RELIGULOUS becomes just another preach to just another choir. Creator of RELIGULOUS, political commentator, Bill Maher, is a super-comedian in the mold of Lenny Bruce and George Carlin – using satire to bludgeon societal stupidity. Religion is a major stupidity that I love this man for bludgeoning. RELIGULOUS starts where it’s all going to end: Megiddo. Maher stands in a rubble pit in Israel, where the Book of Revelation foretells the End Times. Maher interviews scores of people across the globe, from southern U.S. hillbillies, to European religious professors, from ex-Jews for Jesus, to Hasidic Jewish elders; from Islamic leaders to excommunicated Mormons; from Italian Catholic dissident priests to a Muslim gay bar in Amsterdam. An evangelist tells Maher: “Faith has a way of softening people” (obviously hasn’t read about the last five thousand years of religious wars); when Maher asks a senator, “Surely you don’t believe in a talking snake?” the gullible senator’s reply (which should scare to hell everyone in his state), “You don’t have to pass an IQ test to be a senator.” One thing becomes strikingly apparent about Maher that cannot be said about the “holy” and “ordained” and “theological” people he meets – he knows his bible. RELIGULOUS is BORAT-meets-Christopher Hitchens – dumbasses abound, given enough rope to hang themselves at the Tyburn Tree of intellectualism. Reminds us of the TREKKIES movies, where the entertainment value stems from the fanatics just being their bad selves. Maher uses religious and pop culture media in snippets sprinkled liberally, to temper the supposed theological gravitas of his interviewees (like TV’s DREAM ON used to punctuate gags or irony), but these snippets are gravy, as most of these lollygaggers unintentionally temper their somberness with their own religious ignorance. Some of the interviews are laugh out loud: meeting with Jose Jesus Miranda, of the Growing in Grace Ministry, who maintains he is the actual descendant of Jesus: “Yes, I am the Second Coming. There’s David, then Jesus, then me”; the scientist who claims, “There were eyewitnesses [to the bible writings],” who, upon being pushed by Maher (“Oh, come on! There were no eyewitnesses!”), backpedals, “They were close to that, a couple of decades.” Some “scientist”! ; the Exchange Ministry, run by an ex-gay guy who considers himself never to have been gay, “just lost for awhile”. But Maher never lets viewers forget what Christopher Hitchens and Richard Dawkins illustriously outline for us – the delusionally-insane and death-mongering side of religion. A Muslim leader tells Maher, “Islam means peace,” which Maher juxtaposes with visuals and statistics of Middle Eastern war. (The Arabic root “salema” or “salaama” may mean “peace, purity, submission and obedience,” but in religious context, Islam means “submission to the will of God and obedience to His law.” Subtle difference, Religious Scholar Guy.) Cue endless war with infidels. In Jerusalem, the muslims Maher interviews cannot even agree on the story regarding a holy area, let alone where the boundaries of that prescribed “holy area” begin. It is all Maher can do not to raise his eyes to a nonexistent heaven and beseech a nonexistent god for patience. Or another punchline. With his questioning, Maher seeks understanding of why people believe what they believe – usually finding blank-walled stupidity, obliviousness, misinformation, illiteracy, self-denial and downright imbecility. What scares and concerns Maher is finding Certainty: Certainty about being “chosen” people, Certainty about existence after death, Certainty in uneducated belligerence that your beliefs are “right”… With Certainty, comes a closing of the mind – nothing else can infiltrate if you believe you’ve identified an eternal truth. Maher notes: While the other guys are selling Certainty, he promotes Doubt – the only way to actually seek truth, be it transitional or eternal. And let’s face it: People who need religion as a reason to be good to other people, well – what kind of people are they? 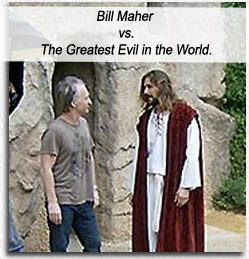 In the earlier stages of the film, Maher puts the sense in common sense, trying to reason with fanatics who believe in “miracles” like “asking God for rain and having it rain” – as the film progresses, though, he gives up on these maniacs and joyously takes the piss out of everyone. By the time we arrive at the Creation Museum, we’re on the Straight Piss Express. Some critics remark on Maher’s condescending attitude as an atheist. I guess the last few thousand years of religious condescension toward atheists doesn’t count. And Bill Maher has every right to be condescending because he is not an uninformed soapboxer (he actually joins the loonies at Speaker’s Corner in Hyde Park, London, bluntly describing the tenets of Scientology – and sounds every bit as loony as Scientologists themselves); he is intellectually armed and battle-ready, and – this may come as a surprise after millennia of condescension – Maher and the rest of Us Atheists know something that Religions don’t: we are right. 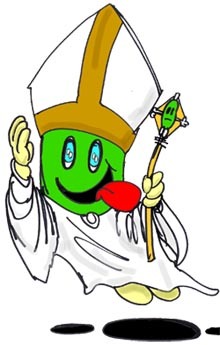 Surprisingly, the only people who display a modicum of good sense in RELIGULOUS are Catholics! After being kicked out of the Vatican, literally, Maher interviews a Vatican astronomer (which is almost an oxymoron, considering most christians believe the universe revolves around Earth), who freely admits that even Pope John Paul II said “Evolution is accepted by the Catholic Church” – an intelligent, lucid, open-minded scientist (which makes it all the harder to understand why he believes in the non-evidential god) who talks of Jesus’ christmas birth date established approximately 349 A.D. Hmm… with such knowledge, should this guy really be a priest? Ironically, Maher ends on a preachy note, “Religion must die for Mankind to live.” It’s true, of course, though it probably won’t be so cut-and-dry when it happens. Zeus and Thor and Venus took thousands of years to sink into the mists of legend. How long will it take Jesus and Mohammed and Joseph Smith? Belief in GOD? Belief in ME? Exactly the same results. Read my full rant here: CALL ME GOD (and I’ll still respect you in the morning). What message can we atheists derive from RELIGULOUS, besides the obvious dead-horse-flogging? We get it that RELIG(ion is ridic)ULOUS, so what more preach can he sling at this choir? Maher says it loud and proud: Stand up for what we DON’T believe in! Maher entreats atheists to be not afraid of our affiliation, pointing out that atheists are 16% of the American population, noting that smaller contingencies boast stronger lobbying groups, such as the gay population. With such a large percentage, fear not the mongol hordes of religionistas and their Machiavellian ignorance and hate-mongering. Stand firm on our platform: REALITY. And I would add to that: DO IT. It’s not as hard as you think. I’ve been starkly forthright about my atheism over the past decade, going so far as to correct people when they ask for my “christian” name. Don’t they all just relish wallowing in the syrup of taking it for granted we’re all part of their fantasy? “Christian” name implies a far-fetched “belief” in Christ. I have merely a FIRST name, spank you very much: Poffy. But you can call me God. Christians – who needs ’em? We know it’s not YOU – but it IS your Klan, your professed “religion,” your chosen people. They fulfill every criteria that you fulfill in calling yourself christian. The question looms: Are THEY in the right? Are THEY the “real” christians and you just a vanilla facsimile thereof? Are YOU the extremist for being such a pacifist and not stampeding with the other cows? Christians tout Good as if they have a monopoly on it. Conveniently forgetting that Hitler was a christian, Richard Nixon was a christian, George W. Bush is a christian. Murderers all. It’s just a tag. Why use it at all? Which brings us to the point: People who need religion as a reason to be good to other people, well – what kind of people are they? Burning at the stake, the iron maiden, waterboarding – all invented by Good Christians. Drop the tag – just be good. Do good. Be principled, educate yourself, decry superstition.